Normally when I roast vegetables I’m all about getting maximum crunchiness and caramelization, but a few years ago I discovered this method of roasting vegetables from Luisa Weiss at Wednesday Chef. Here the vegetables are chopped into small pieces, then slow roasted for hour or more, until the flavors meld and intensify. For an entire summer – when the heat wasn’t too intense and I could bear to turn on the oven – this was how I roasted vegetables. In the summer-time I use a combination of potatoes, tomatoes, zucchini, eggplant and red pepper and its more like a Greek briami then your average vegetable roast. 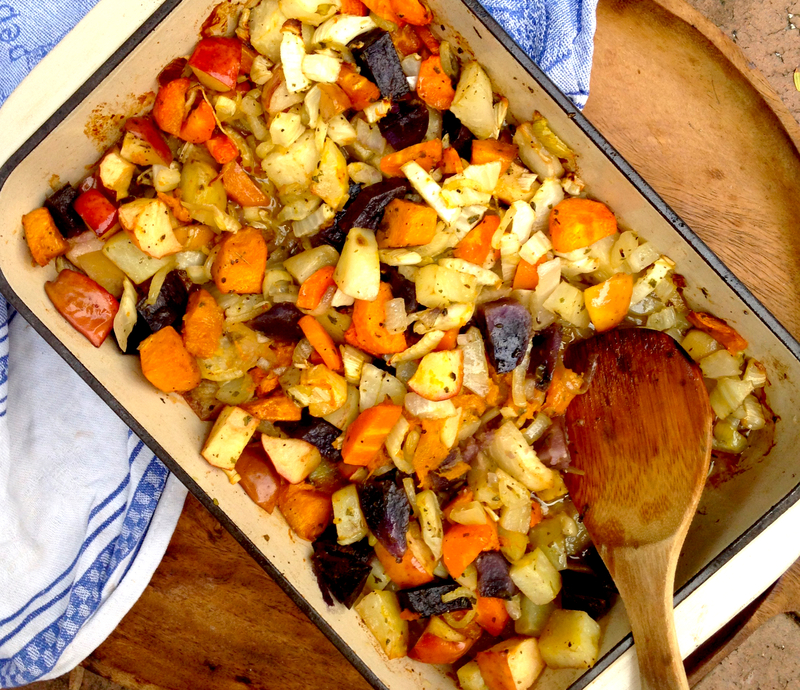 For this winter vegetable roast I used apple, fennel, kohlrabi, pumpkin and potatoes (including a couple of purple potatoes which were the most amazing color and texture with a slight nutty flavor) but you can use any combination of vegetables. Remember be generous with the olive oil, it’s all about the vegetables roasting slowly in their own juices and oil. If you want to make a complete meal of it, throw some chunks of feta into the vegetables and bake until melted just before serving – so good! verjuice if you have it on hand is good. Preheat oven to 150C. Chop onion into quarters and slice thinly. Chop fennel into quarters and slice. Peel pumpkin, carrot, potato and kohlrabi and chop into one centimetre pieces. 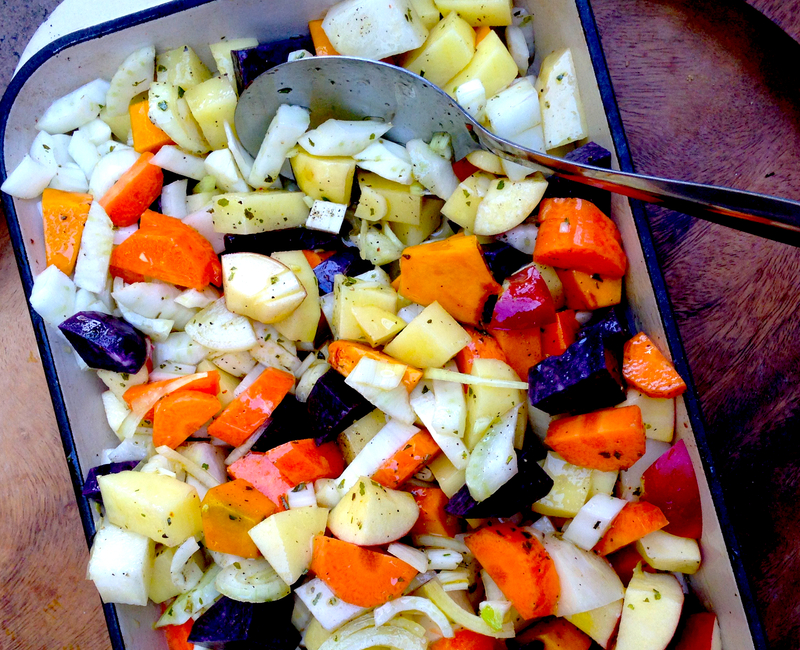 Chop enough vegetables to reach the depth of five centimetres in your baking tray. Mix vegetables together with garlic and onion. Dress generously with olive oil, season with salt, pepper and herbs to taste. Add a few splashes of verjuice to taste. Bake in oven for one hour to one and a half hours until vegetables are tender.